Home » Viral Posts » A female green anaconda squeezes a male to death after mating. A female green anaconda squeezes a male to death after mating. 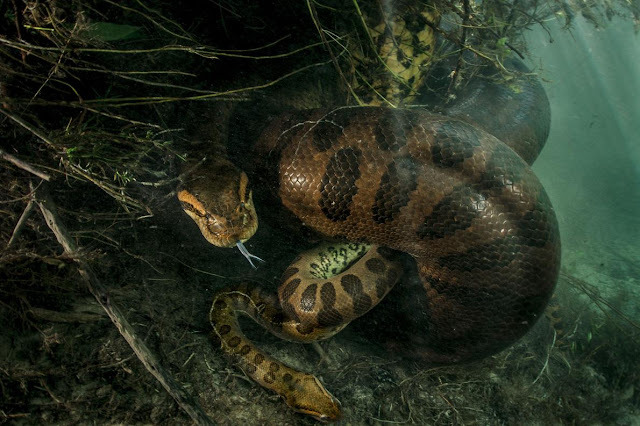 Photographer Luciano Candisani has captured the first-ever photographs of a green anaconda squeezing her mate to death in Brazil.While tracking down a particularly large snake in the swamps of Brazil, photographer Luciano Candisani got more than he'd hoped for: the first known image of a female green anaconda squeezing her mate to death.As thick as a "truck tire," the female was well known to local guides Juca Ygarapé and Daniel de Granville, who took Candisani to her usual haunt in the Formoso River. They found her half-out of the water, entangled with a small male on the river bottom—perhaps, Candisani thought, a post-mating embrace. He watched the pair for a few hours, taking some underwater photographs from about three feet away.